WE HAVE JUST completed the greatest celebration of the Christian year: the Feast of Easter. Now we hear the wonderful stories of how Jesus appeared to so many different people after his resurrection: proof indeed that, as he promised, he has risen from the dead. We are Easter people who share in the new life which Jesus has won for us and so we boldly say: ‘Alleluia, Christ is risen! He is risen indeed, alleluia!’. But, like the disciples, we might be wondering ‘What now?’. They waited, spending time together in Jerusalem and also back in Galilee. What were they doing? How were they feeling? Surely they must have been anxiously wondering what the future would hold. We, as Jesus’ followers today, must find the ways in which we can live out our calling to be His disciples. What does that mean for us as individuals? What does it mean for us as members of the local church? What does it mean for us all as members of the wider church – our Team Ministry, the churches of North Cheltenham and beyond? In both our parishes of Prestbury and All Saints’ we have identified Sunday 27th April as Stewardship Sunday. Every single one of us who feels that we belong in some way to God’s family in the churches of our Team will be asked to consider prayerfully what response we want to make to the Good News of Easter, to all that God has done for us through His Son, Jesus. And yes, we shall all be asked to make that response a financial one, because the work of God cannot carry on unless it is properly financed. Sunday 27th April is also the day on which we hold our Annual Meetings. This is part of the way in which, as members of God’s family, we can be involved in the life of the church, particularly through the process of election of Churchwardens and PCC members. Two people who have served as Churchwardens, one at St Mary’s and one at All Saints’, are not eligible for re-election, and we shall have the opportunity to say ‘thank you’ to Jerry Porter and Simon Taylor at the Annual Meetings. This means that we shall be looking for other people to stand. At a recent PCC meeting we considered some of the qualities and requirements of a Churchwarden. One that particularly struck me is ‘an ambassador for the church’. Certainly our Churchwardens are ambassadors for the congregations they represent and that has wider implications as we meet together more and more as churches in the North Cheltenham area. But each one of us is also called to be an ‘ambassador for Christ’ (2 Corinthians 5:20) and that is part of our discipleship, part of what it means to be followers of the risen Christ. Not all of us are being called to be Churchwardens! We give thanks for those who have served in this way and we pray that God will encourage others to take on this role. We are all being called to review constantly what it means to be a disciple of Christ, to be an ambassador for Him as we share the Good News of His resurrection. Very many thanks to all of those people who, in so many different ways, contributed to our celebrations of Holy Week and Easter in our three churches. Everything including cleaning, putting up wooden crosses, washing altar linen, being involved in services, etc, etc! It is a huge list and we are all very grateful to you! The consultation period for the draft Scheme, which is the legal document which will establish the North Cheltenham Team Ministry, has now ended. Both Prestbury and All Saints’ PCCs unanimously agreed to support the scheme and have communicated their agreement to the Church Commissioners. We now wait to hear whether any representations against the scheme have been lodged. If so, these would need to be investigated by Bishop Michael, who would have to communicate with the Church Commissioners and a hearing would probably be held in London. This means that it is still not possible to give any date for when the new Team Ministry might come into being. As you will appreciate, this is particularly difficult for the people at St Peter’s as they await the closure of their church. Please keep them all in your prayers. WEDNESDAY the 12th March might well be remembered as the day the Races were cancelled but some of us will remember it for a different reason – the Easter Prayer Maze. On the Tuesday afternoon some of the Open the Book team set up five prayer stations in St Mary’s church. Each station depicted a part of the Easter story, starting with a Palm road, a table set for the Last Supper, the Garden of Gethsemane, Good Friday represented by St Nicolas’ Christmas tree cross and Easter Sunday represented by a beautiful spring walk leading to the tomb. The children went round the church in small groups of up to six children accompanied by a parent or teacher helper. Each prayer station was manned by someone from the Open the Book team or a School Governor. The children had the opportunity to experience prayer through their senses by doing a number of different activities ranging from lying quietly and listening to bird song and music, making Playdoh crosses to lay at the foot of the cross, drawing pictures on pebbles and seeing and smelling the signs of new life. Each child was offered a small Fairtrade Easter egg as they left the church to remind them that Jesus died so that we can have a fresh start through him. A special thanks to all those who gave up their time to give the children an opportunity to meet with God through prayer. This year, more than ever, Christian Aid needs our help. Last year’s earthquakes, floods and hurricanes made us all more aware of the problems caused by climate change and the need to cut our carbon emissions. Christian Aid’s work is very varied: it aims to give emergency relief, to help poor communities find a viable lifestyle, to provide clean water supplies and to raise awareness. The house-to-house collection will take place from May 11th-17th. We hope that our loyal volunteers will be available to collect and we should like reinforcements, especially at St Mary’s, where we need people to organise the distribution and collection in sub-groups of ten roads. Please get in touch with us if you can help and please give generously when the time comes. It was a very diverse group – there were young people from all four evening groups and a great team of leaders and young leaders (and Ben!) – in all 39 of us! Night hike, wide games, drumming, diabolo, card making, digital photography, baking, video making, worship, football, basketball, volleyball, kayaking, mountain biking, low ropes course, bonfire, quiz night, sculpture trail… and a little sleep… The fantastic worship and the other creative activities were led by our own young leaders and leaders. So what did the young people think of it all? Look out for a creative arts evening in the autumn including a display of photos taken by young people. When confronted with the need for thousands of extra pounds, a lot of us spend a lot of time mind-searching and head-scratching only to find the best ‘new ideas’ come out of the blue, and in this particular instance from a totally new direction as well. Please make a note of this date, Saturday 24th May, because that is when an evening entitled Our Heritage through the Eyes of an Artist takes place in St Mary’s Church. A regular member of the 8 o’clock Sunday morning congregation, Derek Henman, decided to draw in pen, pencil and ink the parts of our church which the Quinquennial Review considered in need of repair. These pictures have now been elegantly framed and Derek, an established local artist, has donated them for auction to raise money for the repair bill. Father John Mead will open the evening with a short explanation of meeting quinquennial demands. As a long-serving rector of St Michael’s, Bishop’s Cleeve, he survived many such ordeals. Derek will then display numbered photos of his pictures on our big Celebrate! screen with little explanations, then we adjourn for a fork supper with wine or coffee whilst people view the real pictures. At 9pm sharp the auction will commence. It will be an entertaining evening even if you are not a prospective purchaser. Tickets will soon be available priced £6, to include supper and a glass of wine, and there will be a bar for you to buy extra glasses of wine or coffee etc. The Annual General Meeting of the Prestbury Hall Users’ Group took place on the evening of 3rd March 2008 at Prestbury Hall. After being welcomed, the thirty people in attendance were introduced to the trustees by the chairman Cyril Beer. The roof and ends of the hall have been covered with an insulated metal cladding which is not only more durable but also improves the heat retention. The heating system has been replaced with a condensing boiler and low surface temperature radiators, the latter being child friendly. The sanitary ware in the toilets have been replaced with more up to date equipment. Additional child-friendly basins have been added to both toilets, which have been redecorated. Gloucestershire Highways Department, in their design to improve the safety of the pedestrian crossing wanted the entrance to the hall to be moved. The trustees agreed to this, and as a result, the fencing and gate have been replaced, which has much improved the appearance of the hall. John explained that these improvements were the start of a programme to enhance the hall. The next project was to replace the windows and doors with double glazed PVC frames that will further reduce the heat loss. It is hoped that this will be followed by improvements to the kitchen. The meeting ended with the chairman stating that many organisations and local families use the hall, but that more would be welcome. The meeting was followed by refreshments and closed at 9pm. Everything went according to plan and the weather stayed just about fine. A little drizzle started just before 11am but this did not deter all the enthusiastic workers in St Mary’s churchyard. Thank you so much for turning up to this event, both those who worked outside and those who spring cleaned inside – not a cobweb in sight! We enjoyed coffee and hot sausage rolls in the middle of the morning, which went down a treat. Thank you John Fogarty at the Bakery Stores for the sausage rolls. This interval enabled us to chat with one another, especially with those whom we do not know very well. Thanks once again. On Thursday 6th March 2008 fifteen members of the Flower Arrangers met at Sheila Beer’s house, with fourteen apologies. The meeting opened with a prayer and the report of the 2007 AGM was read and agreed. Margaret Waker gave her Treasurer’s report, which had been audited by Noel Brick. It had been quite a good year and there is some money in hand. Lotte Rule and Thora Anstee were thanked (in their absence) for overseeing the Mothering Sunday sprays and Harvest Festival posies. Many thanks must go to the ladies (not all flower arrangers) who willingly help with these tasks. It was thought that a few ladies from Celebrate! might like to contribute with the Mothering Sunday sprays another year. There are ten weddings arranged so far for 2008, which is down on last year, and this is where any profit is made. As all expenses relating to flower arranging and the price of flowers has risen, it was decided, that in 2009, there would be an increase in the price of a pedestal and pew ends for weddings, and the allowance given for Festival flowers. Lindsey McGowan was thanked for all her hard work entailed with the weddings and Festivals. A thank you must also be made to the ladies who assist Lindsey on these occasions. It should be noted, that the flower arrangers personally fund the beautiful flowers seen week by week, throughout the year in church. I am sure you will all agree that they do a fantastic job. Thank you ladies! 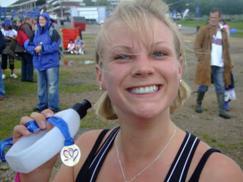 This year I plan on fulfilling a life ambition by running the London Marathon! 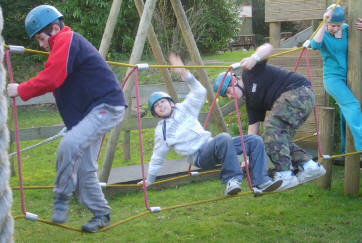 I am raising money for a really worthwhile charity, The Outward Bound Trust. The Outward Bound Trust provides life-changing opportunities for young people, enabling them to explore their potential in a unique way. Outward Bound is a charity Mum (Diane Lyle) is heavily involved in and, when aged 17, I attended an Outward Bound course myself. It was a life changing experience where you were free to discover who you really were, try things you never thought you'd try to learn things about yourself from these experiences as well as the other people around you. Having worked with young people and witnessed what Outward Bound can do for them I truly believe all the effort, time and pain I am going through is completely worth it. I am hoping to raise £1300 for my charity and can't do this without the support of friends and family. The support by donation and prayer will be much appreciated as I think my legs and I need all the help we can get, 26 miles is a long way! I run the marathon on 13th April. ON A COLD and frosty 21st January at 3.40am our taxi arrived to take us to Heathrow Airport, and then onward to Madrid where we changed planes for the long haul to Quito, in Ecuador, arriving at 5.50pm local time. My first impression on leaving the airport was the warmth, followed by watching locals greeting their loved ones and wondering if it was friends coming for a holiday or had they just arrived back home after working abroad for a while. After going to bed early and having a good rest and two mugs of coca tea (we had arrived straight into high altitude in Quito at 9,500 feet above sea level), we were up early the next morning to start our sight seeing tour of Ecuador. 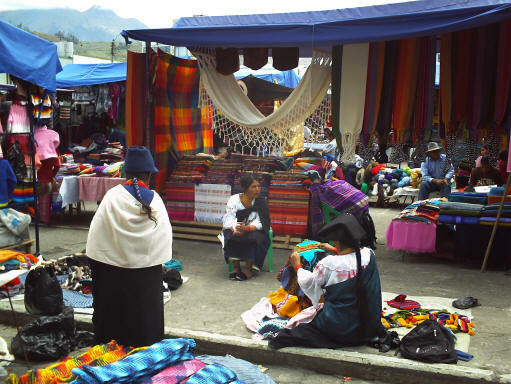 During our stay in Quito we were introduced to various aspect of the country: the Old Colonial area of the city, the rural areas and colourful local markets. Watching the natives making figurines from bread dough, an ancient craft, was fascinating. We enjoyed Ecuadorian food at several family run haciendas, variations of potato soup being one, with avocado and cheese put in when served. In one hacienda after our meal we were entertained with a Rodeo. Even higher altitude was experienced when going up to view the Cotopaxi volcano (17,000 ft) where we were walking by the lake which was 12,500 ft up and admiring the wonderful small flowers that grew at that height. We also visited a rose farm and then were taken to the owner’s farm house and refreshed with a sumptuous afternoon tea prepared by his wife. It was also interesting to stand on the Equator with one foot in the northern and one in the southern hemisphere. A thirty-minute flight south took us to Cuenca; here again we visited the ancient part of the city, a ceramic store and the Panama Hat factory, now largely a cottage industry, but established originally to give work to prisoners who had been put in prison for being drunk and disorderly. Great fun was had trying on the hats and some purchases made. On the Sunday we were able to visit the new Cathedral where a packed service was taking place and it was lovely listening to the priests and congregation singing with such faith. We went to even higher altitude after this, climbing high into the Andes to Cajas National Park 14,650 ft above sea level, en-route passing villages where pigs were being roasted outside on a spit for Sunday family lunch. What were my impressions of Ecuador? A lovely country, steeped in history, a warm and friendly people, very proud of their Indian ancestry. Many of the ordinary people living a simple life with their own small plot of land, with hens, a cow and growing their own vegetables in the fertile soil. The teenagers were similar to our own with their mobile phones etc and I noticed that even the small communities had an internet cafe keeping up with modern communications. I was struck also by the amount of washing that seemed to be every where: on lines, hedges, fences and even trees; they either must have large families, or are always washing their clothes. Flying into Guayaquil in pouring rain, when approaching to land we thought the area was flooded; but it in fact was paddy fields where rice was being grown. Guayaquil is a very modern cosmopolitan city and as the rain did not stop it was thought a tour of the city by coach was the best option, this was agreed. Next day, waiting at the airport to leave for the Galapagos Islands (after a 2½ hour delay due to our plane being unable to take off from Quito in thick mist and heavy rain) Angie, our tour leader, said ‘Now this is where your holiday begins’ but I will reserve judgement on that score for the moment. I like bite sized chunks of things, I feel you can get to grips with them and get to understand them. That is why I have chosen this particular psalm. It is the shortest of the one hundred and fifty songs in the Book of Psalms. It is a hymn or verse or form of words glorifying God – a doxology. It is well suited to public worship and is in sharp contrast with psalm 116, which is much more of a prayer for individual use. Psalm 117 follows the normal biblical poetic structure whereby a thought, theme or topic is expressed, then immediately repeated by an almost identical one; so a kind of couplet results. Additionally, in the Hebrew original the two lines have a rhythm of three or four beats to each line, though this is invariably lost in the translation. Poetic forms are found in many other parts of the bible including the books of Proverbs, Lamentations and Job. I was intrigued to be told that most contemporary bible translations set such text differently from other narrative, which helps it to stand out. In Hebrew the Book of Psalms is known as the Book of Praises. These are hymns or songs of praise. Glancing through Psalms from the beginning I gave up counting those which begin along the lines of ‘give thanks’, ‘praise’, ‘extol’ or ‘sing for joy’ once I had reached thirty. You may care to complete the exercise for yourself. I contend the act of praising God lifts the spirit – even when the going is tough and it may not be the first thing to spring to mind. It lifts you out of yourself and adjusts your focus to God. Perhaps, since it was for this purpose we were created, it is the only truly satisfying thing we are able to engage in. Some of the ‘praise’ psalms are thanksgiving for God’s deliverance from distress, acknowledging him as rescuer. Others are laments, normally combined with a cry for help. Patently life is not a painfree experience and nor should we, as Christians, expect it to be. We do not need to pretend to anyone, least of all ourselves, that there are no problems. Rather we need to hold on to the assurance that our saviour is ever alongside us. Some scholars consider this short psalm looks forward to the new covenant put in place by the life, death and resurrection of Jesus. In the context of the old testament there is a special relationship between God and his chosen people the Israelites. After the coming of Christ the relationship is between God and the wider world of the Gentiles – all the nations. What love is as unfailing as that of Christ for all people? The truth or, in more modern translations, the faithfulness of God does indeed extend to all people and for all time. What a fact to ponder on – it is enough to spur one on to ‘Praise the Lord’. 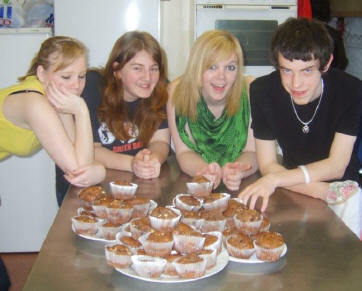 Youth work finishes on Thursday 3 April and restarts on Sunday 20 April. Following my initial enquiry before Christmas I had several people show an interest in re forming a Drama Group in Prestbury. (This will not impede on the Women’s Institute Christmas Pantomime, as the idea would be to do occasional ‘one-off’ productions.) For those who are interested I have booked St Nicolas’ Church Room for 7.30pm on Wednesday 9th April and hope that all who previously contacted me, plus anyone else who may be interested, will be able to come along. We will then decide, depending on the number involved, whether it is a viable proposition or not. Many thanks. This will take place on Tuesday 15th April in St Nicolas’ Church from 11.30am to 12.30pm. It would be nice if as many MU members as possible could join us for that hour. Anyone else is more than welcome to attend if they wish. The next bakestall at the 11 o’clock service at St Mary’s will be on Sunday 20th April, when we welcome contributions from the G-M surname team. As a result of our February special appeal, together with the proceeds from the Sunday Refreshments, we were able to send an impressive £150 to Care International. By taking advantage of the EU fund scheme this will give them £600 to help some of the world’s suffering poor. A heartfelt thank-you to everyone who make this possible. Our April meeting takes place on Tuesday 22nd April in the Upper Room at St Mary’s Church at 7.30pm. Our guest speaker will be Mr Edward Wyatt, who has called his talk By George – a Fox!. Come along to find out what this is all about – you may be very surprised. Blue Moon Harmony (mixed voice choir), with conductor Charmaine Worrall and accompanist Pam Taverner, are giving a concert entitled SPRING AIRS including Songs from the Shows at St Mary’s Church, Prestbury, on Saturday 26th April at 7.30pm in aid of the Church repair fund. Tickets costing £6 can be purchased from Margaret Holman or Avril Keen at St Mary’s, Janet White at St Nicolas’ or at the door. Do come along and enjoy a musical evening now that the lighter evenings have arrived, and at the same time support the repair of our lovely old village church. Please make every effort to attend the Annual Meeting of Parishioners and the Annual Parochial Church Meeting, on Sunday 27th April at 6:30pm. During these meetings, Church Wardens and PCC members will be elected. Please see church notice boards for nomination lists which will be posted from Saturday 5th April. All Churchwardens are elected for one year only. This year Jerry Porter is not eligible to stand for re-election under the 6 year rule which requires him to 'stand down' for a year. There will be 2 vacancies for the PCC; 1 for each church. Our Annual church meeting will take place on Sunday 27th April. Prior to this meeting, I have to prepare a report which needs to include a small “thumbprint” paragraph for each committee or work in a specific area that needs to be mentioned. I would be most grateful to receive your short article by Sunday 6th April. Come to the PPY AGM, and for wine and nibbles beforehand, on 27th April 2008. The AGM of Prestbury and Pittville Youth will follow the Prestbury Parish AGM in St Mary’s on the evening of Sunday 27th April. As they did last year, the Executive Committee are inviting you for wine and nibbles between the two meetings. Please join us then to show your support for our young people. I need to prepare a Prestbury & All Saints’ Team Worship Calendar for the second half of 2008. As part of that process it is very helpful for me to have a representative group to consult with. As part of the consultation we will need to consider, for example, how we keep the Patronal Festivals of our various churches. The meeting will be on Monday 28th April at 7.45pm in St Nicolas’ Church Room. Please speak to me if you would like to join in. The next team Quiet Day will be held at Nympsfield Marist Centre on the Saturday before Pentecost Sunday. The title of the day is ‘Tongues of Fire’. The cost will be £15 per person, which will include lunch provided by the Sisters. There is a maximum of 30 places available. Further details next month. Please tell all your friends and help to make the weekend a great success. Just a note about our team lunches which we hold every three months or so at the Royal Oak in The Burgage in Prestbury. We have just had a lunch on March 30th and the next one will be advertised in due course. My reason for writing now is that several people have recently asked me which team does this meal accommodate. Well, the answer is anyone within our team ministry of Prestbury and All Saints; it is not exclusively for any one church in particular, nor any committee team, but is open to all on a first come, first served basis. We can take approximately 75 people at any one time and you are all invited and eligible. Please call me if you are interested in joining us next time a lunch is arranged. 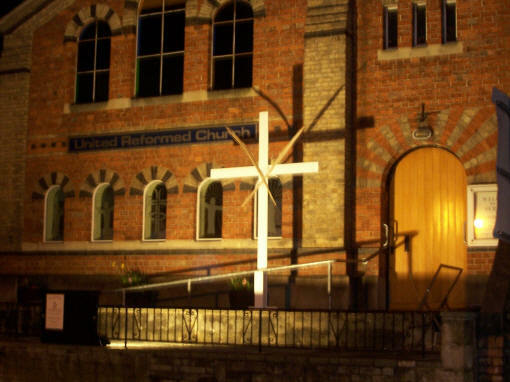 A dedicated small group of Church members – ‘The Hall Committee’ – is responsible for the finances, the day-to-day and long term running of the Hall, which is widely used by Church Groups and several other Groups in the community. At the present time we are looking for one or more willing, helpful persons, male or female, to join the Committee to replace a member who has resigned for career related reasons and also to increase the number of people on the team. We meet four times each year, in members’ homes, usually in the evening, and work in close liaison with the Team Office for lettings, etc. If you or someone you know would like to join the Committee, or you need further information, please contact the Secretary, Alan Jackson. Once again, very many thanks to all the ladies who so generously donated and arranged the posies for Mothering Sunday. As usual, they (the posies!) were all so beautiful. Thank you. Many thanks to all who supported the Police Choir Concert at All Saints’ Church. It raised £862.10 for the St Vincent’s Centre in Pittville and they were extremely grateful for our efforts. Thank you to everyone who helped at St Nicolas’ during Gold Cup week. £2280 was collected from the parkers and £130 for the teas and coffees, giving a grand total of £2410. This is slightly down on last year but we had one fewer day. Tony Mason was in charge of the parking while Gillian Jackson looked after the catering. We are currently producing a documentary film series about WWI, to be broadcast in 2009 on History Channel in the UK and History Television in Canada. Of particular interest to us is the experience of soldiers in the Sixth Tank Battalion during one of the most significant tank battles in history – the Battle of Cambrai, November 1917. At this battle, Sixth Tank Battalion was commanded by a certain Major Arthur McCulloch Inglis, DSO. As Major Inglis died in his hometown of Cheltenham on 12 May 1919, and is buried in the family grave at St Mary’s Church, Prestbury, we are hopeful that someone may point us to any of his living relatives, or failing that, any memoirs, diaries or other memorabilia that Major Inglis may have left behind.